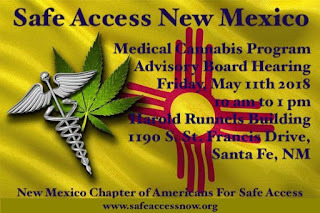 SANTA FE, N.M. — This first week of April comes with the New Mexico Department of Health releasing a Medical Cannabis Program Assessment and the monthly Medical Cannabis Patient Statistics Report (2018-03-31). 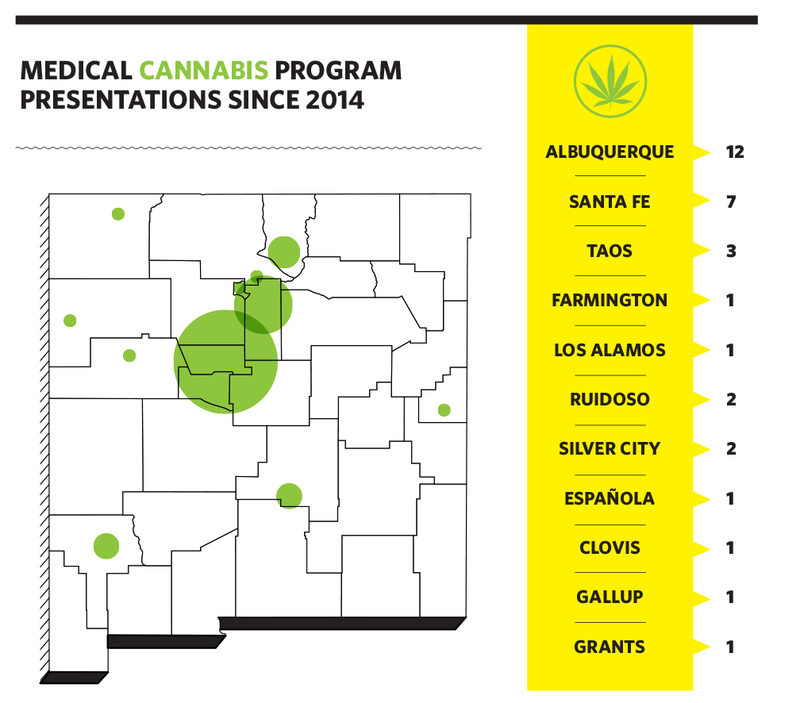 There is now more than 50,000 patients benefiting from medical cannabis in New Mexico's medical cannabis program. The latest figures from the state Health Department show a total of 50,954 patients were enrolled at the end of March. That's an increase of nearly 46 percent from the same time last year. Active Personal Production Licenses (PPLs) from the March report shows 6,847 patients cultivating their own medicine. 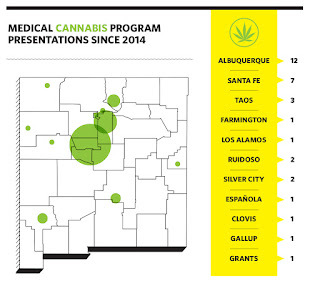 New Mexico now has 35 licensed non-profit producers or LNPP’s operating 72 medical cannabis dispensaries statewide. State health officials have been careful over the years to expand the list of qualifying health conditions. Still pending are several petitions from 2017, when the Medical Cannabis Advisory Board met twice, once in April and once more in November. The first medical cannabis advisory board hearing for 2018 is on Friday, May 11th from 10 am to 1pm at the Harold Runnels Building (1190 S. St. Francis Drive, Santa Fe, NM). News on the pending final decisions from Health Secretary Gallagher are expected for the following petitions, the advisory board doctors recommended to add into the program. Those recommendations are to allow medical cannabis for: ADD/ADHD, Degenerative Neurological Disorder, Eczema / Psoriasis, Muscular Dystrophy, Post-Concussion Syndrome & TBI, All Types Seizures (such as: psychogenic neurological disorders; Motor Disorders / Motor Development Disorders), and Substance Abuse Disorder(s) (to include Opioid Use Disorder). The Advisory Board Doctors also recommended the following four medical treatments be added into the state's medical cannabis program; Pediatric Oncology & Medical Cannabis Use for Antiemetic in State Hospitals(letter of support for policy change), Change/increase possession limit to 16 oz for Patients, Removal of Potency Limit on THC Content for Concentrates, and add Patient Run Collectives. All Petitions Provided by Lynn & Erin Compassionate Use Act Patients Coalition (LECUA) of New Mexico Can Be Viewed Online At: LECUA NM MCP MCAB Petitions . We did not see any lawmakers act on these recommendations from 2017 during the 30 day legislative session for 2018 either, but lawmakers and the Governor did decide to pass legislation for GW Pharmaceuticals (HB-139 “Marijuana Derivative Drug Exemptions”). The big pharma bill, lead by Rep. D Armstrong and a out-of-state lobbyist, was a direct result of a foreign pharmaceutical company, GW Pharmaceuticals, using their vast wealth to pay lobbyist to bring this forward. This legislation signed by Governor Martinez, makes it way to easy for George Soros and German Bayer AG, that has a signed an agreement with GW Pharmaceuticals for joint research on a cannabis-based extract. And Bayer AG agreed to an exchange of technology with … Monsanto, both according to exchange the results of their research. Thus Monsanto has discreet access to the work of the cannabis plant and its genetic modification. That bill was a gateway drug bill for big pharma into the New Mexico Medical Cannabis Program. During 2017 the Medical Cannabis Program office has continued to do a really nice job in maintaining the administrative aspect of the program with a application processing time average of 20 days. The program office continues to grow as well, with a new medical director, Dr. Leah Roberts, adding a health educator, adding a environmental scientist, and currently seeking to fill a couple other positions as well. more than 14,400 patients between the end of January 2017 and the end December 2017. Each day, the Medical Cannabis Program receives between 150 and 600 patient applications. The Lynn and Erin Compassionate Use Act requires the Medical Cannabis Program to approve or deny completed patient applications within 30 days of receiving the application. It also requires the Medical Cannabis Program to print and mail a registry card within five days of approving an application. In Fiscal Year 2017 (July 1, 2016 – June 30, 2017), the Medical Cannabis Program approved 90 percent of completed patient applications within 30 days. And the Medical Cannabis Program printed and mailed 99 percent of patient registry cards within five days of application approval. Patient applications undergo two reviews. patient applications to ensure all required information is completed in an application. 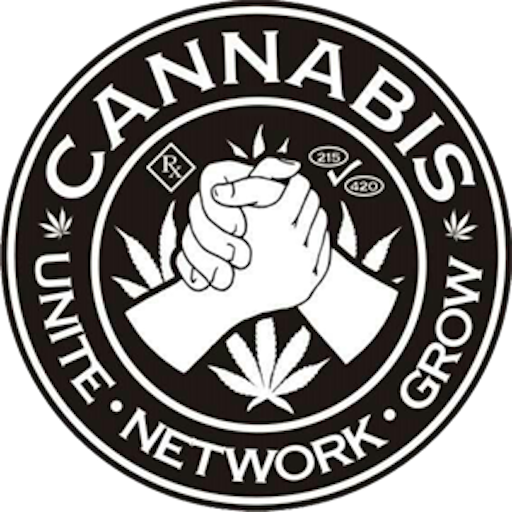 The Medical Cannabis Program has 35 Licensed Non-profit Producers (LNPPs). LNPPs grow and distribute medicine to qualified patients. 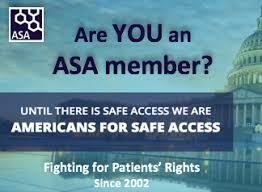 Patients are not assigned to an LNPP, and can visit any dispensary they would like. At the end of 2017, there were 68 dispensaries operating in 19 counties. 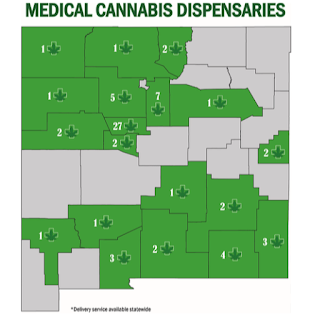 MCP strives to update the Dispensary List online once a month. 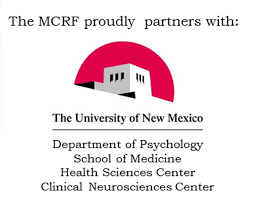 It can be found at https://nmhealth.org/publication/view/general/2101/ . 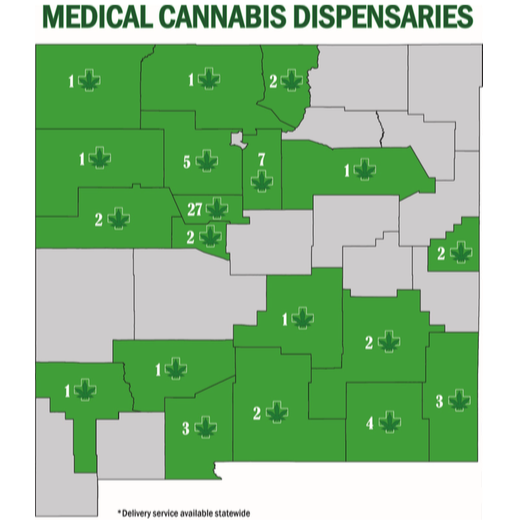 For patients in rural areas, and for patients who cannot leave their homes, MCP approves couriers to deliver medical cannabis to their homes. At the end of 2017, there were three approved couriers. Patients can inquire about delivery through a courier service by talking to an LNPP.Courier service is available statewide. In addition to courier service, an LNPP, as part of their distribution plan, can also deliver medical cannabis. As of the 2017/2018 re-licensure period, at least 5 LNPPs were providing delivery service themselves (not through a courier service). The MCP has a partnership with the Scientific Laboratory Division (SLD). SLD performs compliance audits of the laboratories testing cannabis. MCP and SLD are also working to create a quality assurance lab for medical cannabis. regulatory requirements are followed. In 2017, MCP restructured its office. In addition to a more focused emphasis on testing compliance with the addition of an Environmental Scientist, MCP redesigned the Health Educator position duties. The Health Educator is less involved in the day to-day duties related to processing patient applications and more focused on creating outreach material and talking to stakeholders about the program. 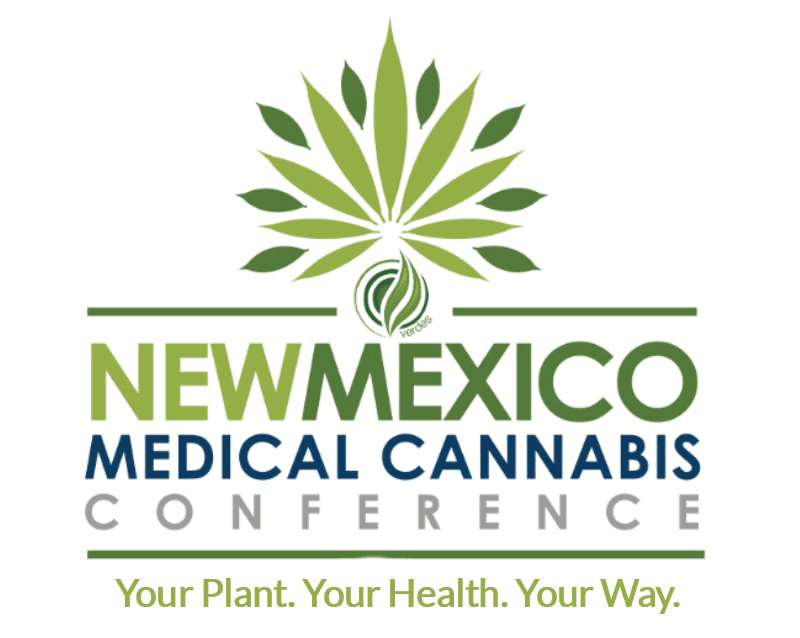 For information on how to request a presentation about the medical cannabis program, you can email medical.cannabis@state.nm.us .